As children, we all dream of being something bigger than ourselves, and that dream usually manifests into wanting to being a superhero. Well, the Guardians of the Galaxy are the types of superheroes I believe most people would turn out to be. Scatterbrained, obnoxious, and a little bit unorthodox, this group of bandits are not what we are used to seeing on screen. Marvel’s summer blockbuster is the adaption of comic not as known to the general audience, but the studio has proven that they can turn even a B-list comic into a fairly formidable movie. 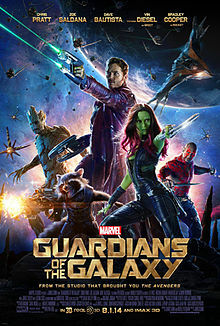 Although we’ve come to expect the Marvel universe to deliver in terms of comedy as well as action, “Guardians of the Galaxy” really takes the cake for funniest group of “heroes.” Peter Quill (Chris Pratt), otherwise self-proclaimed as a galaxy outlaw named “Star Lord”, is first shown rocking out with his Walkman and using rodents as microphones while he steals a device that becomes the object of interest for an alien enemy known as Ronan (Lee Pace). He soon teams up with the likes of Gamora (Zoe Saldana), a weapon-turned-traitor to Ronan, who only moved out of the “token woman badass” trope because of the superb acting from Saldana. Also joining them are Drax the Destroyer (Dave Bautista), as well as Rocket (Bradley Cooper) and Groot (Vin Diesel), a couple of bounty hunters that bear an uncanny similarity to Han Solo and Chewy in terms of personality. It’s hard to say what really drove this film and kept the audience interested. On the one hand, if you look past the lack of character development and cliche trope personalities, the movie is very character driven in terms of waiting for the next time someone says something funny. I found myself very indifferent to the plot, which was predictable at best. However, no one is trying to make Guardians out to be a film that keeps you at the edge of your seat, just one that keeps you holding your sides while you choke on your popcorn from laughter. Something about these characters and the friendship they find in each other hits home enough to warrant a “Certified Fresh” rating from Rotten Tomatoes, and a sequel set for 2017 announced at San Diego Comic-Con this past weekend. Even though humor was the revolving point of the film, the Guardians of the Galaxy make a pretty good addition to the Marvel Universe, and the film lived up to the surrounding hype for the most part. The real question we’re all wanting the answer to, however, is how long will it be before we see a Guardians and Avengers crossover? I’m sure we haven’t seen the last of S.H.I.E.L.D., and I’m sure they will be after certain items just as soon as Nova Corps turns their backs.